Sometimes when you're on holiday in a foreign city, it's nice to take a break from sightseeing and experience the city as the locals do. Amsterdam's Vondelpark, dating back to 1850, offers visitors the chance to do just this, in a relaxed and beautiful public space that sees about 10 million visitors each year. 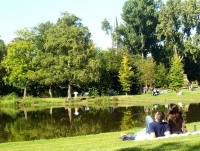 Although the park features several notable attractions - including an impressive statue of Joost van den Vondel (the author for whom the park is named), a film museum, an open-air theatre, a playground, and numerous snack bars and cafes - its great charm is in providing a tranquil space in which to spend a couple of hours doing nothing but watching native Amsterdammers going about their daily business. Vondelpark is the perfect place to get some exercise on holiday, with well-kept and extensive pathways for cycling, walking and jogging - those who are just wandering at their leisure should watch out for all the bicycles zooming around. Although Vondelpark is a great place to take the kids on a picnic, and a peaceful respite from urban sightseeing, sensitive parents are warned that the smell of marijuana smoke will probably taint the air. There are sometimes free performances and concerts in the park as well.